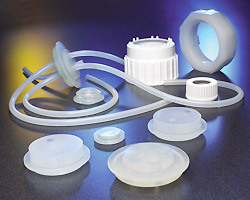 Sani-Tech® EZ Top® Container Closures are manufactured from high-purity, platinum-cured silicone elastomers or thermoplastics, our Sani-Tech® EZ Top® container closure components provide an aseptic seal for handling various high-purity fluids in biopharmaceutical applications. Sani-Tech® EZ Top® container closure allows you to easily retrofit your existing glass and plastic carboys, glass solution and media bottles and stainless steel vessels for aseptic fluid transfer, sampling or sealing. Our Sani-Tech® EZ Top® container closure technology ensures the fluid contact areas are virtually crevice free, reducing the possibility of cross-contamination and loss of product. Sani-Tech® EZ Top® container closure can be completely customized to meet your specific application requirements. Factory installed multi-port configurations with silicone tubing and sanitary dip tubes are available. All high-purity platinum-cured silicone and thermoplastic components can be autoclaved and sterilized for long life and reliability. All Sani-Tech® EZ Top® container closure materials of construction are non-cytotoxic and comply with USP Class VI standards. Sani-Tech® and EZ Top® are registered trademarks of Saint-Gobain Performance Plastics.